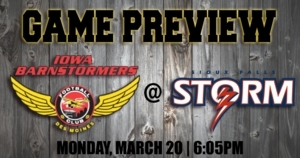 DES MOINES – The Iowa Barnstormers (2-1) are on the road once again as they travel to Sioux Falls, South Dakota to face the Sioux Falls Storm (3-0) on Monday, March 20, 2017. Kickoff is set for 6:05 p.m. CST at the Denny Sanford Premier Center. This is the Barnstormers final stop in a 5 week, 4 game stretch away from home. Fans will have the opportunity to stream the game live on YouTube. The Barnstormers head into Sioux Falls after a 49-30 victory over the Green Bay Blizzard last week. The Iowa defense came up big with a pick six in the first half from linebacker Javicz Jones and an interception from defensive back Matt Goldsmith with under one minute to play, giving the Barnstormers the final possession. The Barnstormers also saw a big game from Ryan Balentine, who had 5 kickoff returns for 112 yards, two rushing touchdowns, and one touchdown reception. The Sioux Falls Storm earned their third win of the season over the Nebraska Danger last week. The Storm saw a slow start to the game, trailing the Danger throughout the first half. The Storm bounced back in the second half, gaining the lead in the fourth quarter and finishing with a 42-28 victory. A pick six from Storm defensive back J’Vontez Blackmon sealed the win. This will be the first of two matchups between these teams this season. The game features two of the best offensive threats in the Indoor Football League (IFL). Iowa’s Brady Roland leads in receiving yards per game with 85 and (T-3) in touchdowns with six, while Sioux Falls’ Lorenzo Brown leads in rushing yards per game with 63. The Barnstormers return to Wells Fargo Arena on Sunday, March 26 for their home opener as they face in-state rivals the Cedar Rapids Titans. Kickoff is scheduled for 3:05 p.m. Tickets to the game are available by calling the Iowa Barnstormers front office 515-633-2255 or visiting www.theiowabarnstormers.com.